Its a handicap race - the slowest runners start first. The first time you enter you will be consulted about your expected time for 3 miles/5 kilometres. When we get it right - more often than not - you all come belting up the finishing straight in close order. Its held every month - since June 1988 - with no plans to stop. 1003 different entrants to date. Please note: the use of headphones in this race is not recommended. How do I enter ?There is no entry fee - and no entry form - just turn up and run. Any age limit ? Our youngest entrant to date was 7 years old and our oldest entrant was 90. When is it held ? On the first Wednesday of every month at 12:30 p.m., except when that is 1st January. Allow, say, 15 minutes to sign in, receive a start time and study the map of the course, which is a flat, clockwise circuit. Where is it held ? 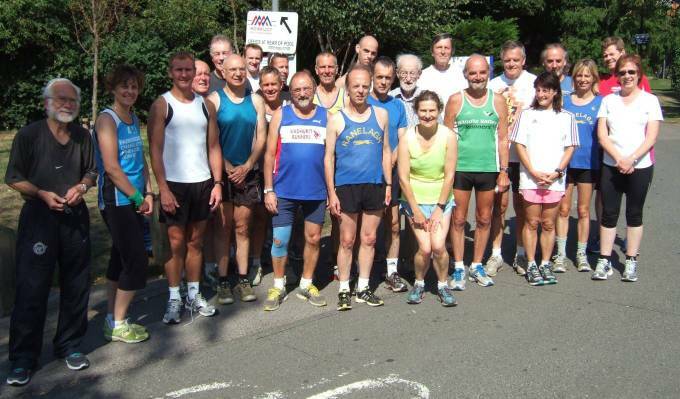 Start and finish are at the Woking Leisure Centre, Woking Park, Kingfield Road, Woking GU22 9BA. Tel:01483-771122. Changing rooms and showers are available or you can come ready changed. Where is that ? The Leisure Centre is in Woking Park, on the Kingfield Road (A247) opposite Woking Football Club ground. White Rose Lane to the back gate of the park). No. 34 bus (Guildford-Camberley) passes the park entrance.